(Nanowerk News) Scientists from the RIKEN Cluster for Pioneering Research in Japan, Chalmers University of Technology in Sweden and the University of Virginia in the USA and collaborators have made observations of a molecular cloud that is collapsing to form two massive protostars that will eventually become a binary star system. While it is known that most massive stars possess orbiting stellar companions it has been unclear how this comes about - for example, are the stars born together from a common spiraling gas disk at the center of a collapsing cloud, or do they pair up later by chance encounters in a crowded star cluster. In the current research, published in Nature Astronomy ("Dynamics of a massive binary at birth"), the researchers led by Yichen Zhang of the RIKEN Cluster for Pioneering Research and Jonathan C. Tan at Chalmers University and the University of Virginia, used the Atacama Large Millimeter/Submillimeter Array (ALMA) telescope array in northern Chile to observe, at high spatial resolution, a star-forming region known as IRAS07299-1651, which is located 1.68 kiloparsecs, or about 5,500 light years, away. The observations showed that already at this early stage, the cloud contains two objects, a massive "primary" central star and another "secondary" forming star, also of high mass. For the first time, the research team were able to use these observations to deduce the dynamics of the system. The observations showed that the two forming stars are separated by a distance of about 180 astronomical units--a unit approximately the distance from the earth to the sun. Hence, they are quite far apart. They are currently orbiting each other with a period of at most 600 years, and have a total mass at least 18 times that of our sun. According to Zhang, "This is an exciting finding because we have long been perplexed by the question of whether stars form into binaries during the initial collapse of the star-forming cloud or whether they are created during later stages. Our observations clearly show that the division into binary stars takes place early on, while they are still in their infancy." Another finding of the study was that the binary stars are being nurtured from a common disk fed by the collapsing cloud and favoring a scenario in which the secondary star of the binary formed as a result of fragmentation of the disk originally around the primary. 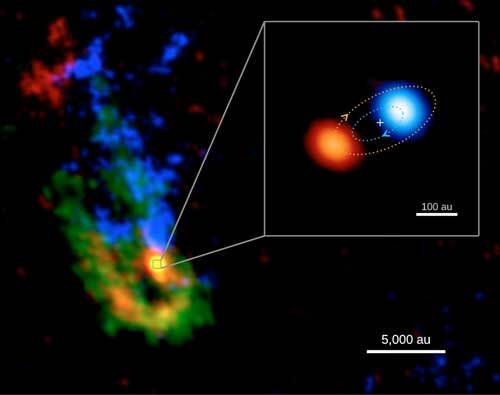 This allows the initially smaller secondary protostar to "steal" infalling matter from its sibling and eventually they should emerge as quite similar "twins". Tan adds, "This is an important result for understanding the birth of massive stars. Such stars are important throughout the universe, not least for producing, at the ends of their lives, the heavy elements that make up our Earth and are in our bodies." Zhang concludes, "What is important now is to look at other examples to see whether this is a unique situation or something that is common for the birth of all massive stars."